Half a dozen rich red roses with green fern in a clear glass vase. 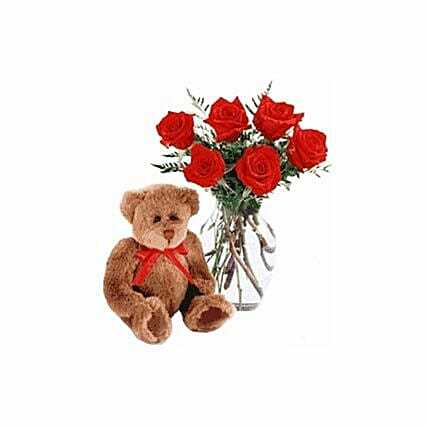 Escorted by a delightful soft brown teddy bear with matching red ribbon. Guaranteed to convey your message of love! The image displayed is indicative in nature.Actual product may vary in shape or design as per the availability. Since flowers are perishable in nature, we will be able to attempt delivery of your order only once..The delivery cannot be redirected to any other address. Flowers might be delivered separately from cakes and they cannot be delivered along with other courier products. We do not deliver on Public Holidays. Occasionally, substitution of flowers is necessary due to temporary and/or regional unavailability issues. When your flowers arrive, just trim the stems and add water.Re-cut 1-2” of the stems at a 45 degree angle.